A mosquito that is known to be capable of carrying the Zika virus has been found in Korea for the first time this year, the Centers for Disease Control and Prevention said Friday. The Aedes albopictus mosquito, also known as the Asian tiger mosquito, was spotted in three of the 39 inspection sites monitored by the CDC since March. 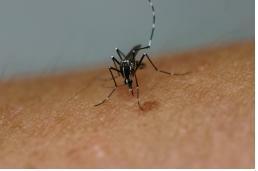 While Aedes aegypti is the species most commonly associated with Zika, Aedes albopictus has also been linked to outbreaks. The three areas include Seogwipo on Jejudo Island, Jinju in South Gyeongsang Province and Cheongju in North Chungcheong Province. The mosquito is known to be able to carry the Zika virus as well as dengue fever and the Chikungunya virus.